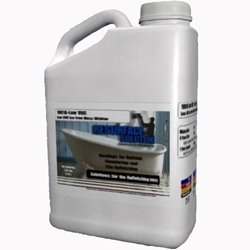 Crystal Clear Coat is a two-component, chemically converting polyurethane resin clear coat. It has a high gloss and is extremely durable. Crystal Clear has the chemical resistance of normal polyurethanes and is highly resistant to impact, abrasion, hard usage, and mechanical abuse. The Urethane Crystal Clear Kit comes as a sprayable 1.25 gallons kit: 1 Gallon Urethane Crystal Clear 1 Quart Crystal Clear Catalyst/Activator Crystal Clear has a 4:1 mixing ratio. See Crystal Clear Catalyst below in Related Items.